things to "strengthen" them. Go figure." Pilates is a method of mind-body conditioning that was developed in the early 20th century, and which has endured and flourished simply because it is so effective. Pilates is recognized by doctors, chiropractors and physical therapists as one of the best conditioning fitness regimens for repairing back pain due to herniated or bulging discs, poor posture habits, sciatica, spinal stenosis and inflexibility. Practice Pilates and you will begin to recognize and connect with these deep core muscles through a variety of exercises performed on Pilates equipment. As you progress, you will move on to more complex and challenging movements that stretch and strengthen the body at once. The result is a strong, supple, and invigorated you. 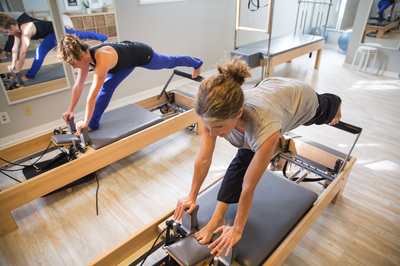 Experience﻿ the difference with Pilates lessons in Atlanta. - Increased strength—lift heavy objects with stability and ease. - Improved coordination & flexibility—run, jump, dance, swing a tennis racket or golf club with less effort. ​In 1912, he moved to England to join his brother and the two of them performed as acrobats and pugilists. During World War I, Joseph – as a German national was placed in internment camp. It is there that he truly started to develop his Mat work exercises. Because of his prior background he was brought to the Isle of Man where he worked with the injured soldiers returning from the war. Joe felt that in order to heal properly that the body needed to continue to move. Consequently he began physically moving and exercising the injured soldiers in their hospital bed. He grew physically tired of doing this work and consequently began utilizing springs from the hospital beds and other props. This original thought process involving ‘springs’ eventually grew into what is now known as the Cadillac or Trapeze Table. After his time on England and in interment camp, he returned to Germany to work with the German police force. By 1926, Pilates started his journey to New York City where he met his common law wife, Clara while en route. Together, they opened their first exercise studio at 939 8th Ave. Over the years the Pilates Studio attracted quite a diverse clientele of the ‘Who’s Who’ in NYC society, Dance Entertainment circles. Joseph Pilates passed away at the age of 87 in 1967 leaving behind a legend that would change the fitness industry in many significant ways in the years to come, his method of “Contrology” became quickly embraced and was years ahead of its time. Over the course of more than 85 years Pilates has continued to grow and thrive and change the face of fitness not only in the US but the rest of the world. Pilates truly was the first US exercise export. No matter where it is being taught now in the world the Pilates method’s roots are traced directly back to the US.